For many parents waiting for a baby to arrive is a happy time. 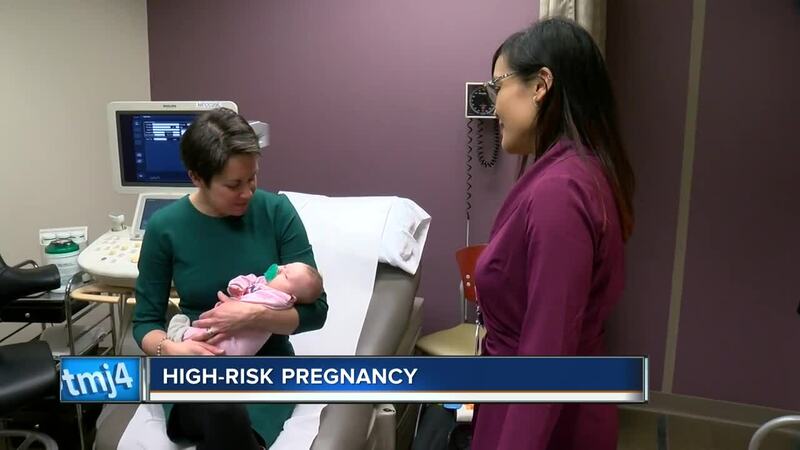 But for those going through a high-risk pregnancy it can be scary and even sad. "I'm going to get emotional because it's very emotional for me, but I want them to look at the ultrasound photo of their beautiful baby and just know that it's going to be OK."
Gretchen Dodgion can share this message with expectant moms now, two months after her beautiful baby was born. Her journey through high-risk pregnancy began as a scary one starting with her 12-week ultrasound. "We knew right away when they showed the picture up on the screen that the baby did not look right." The baby had increased fluid around her neck. Gretchen's doctor was Dr. Meredith Cruz, high-risk obstetrician at Froedtert & the Medical College of Wisconsin. Cruz explained, "Increased measurements tend to be associated with chromosomal issues such as down syndrome." "We were just, we were panicked," Gretchen said, "we were really, really worried." Dr. Cruz said that's common, "Parents tend to be in shock when we're talking about any kind of concern." The panicked feeling didn't last long thanks to the multi-disciplinary approach taken by Froedtert and its Fetal Concerns Clinic. Several specialists took part in calming Gretchen and her husband Chris' fears including a psychologist. "She really helped me through the emotional journey you know, a good six months of it," Gretchen said. Her baby was born in November and brought joy to the Dodgion family. "We are over-the-moon, head-over-heels in love with her. I'm so happy to have her." Froedtert & the Medical College of Wisconsin Birth Centers are sponsors of the TODAY'S TMJ4 Community Baby Shower. The Shower is Friday, January 18th. New baby items such as diapers, wipes, formula, clothes, and toys can be dropped off at any area Sentry Foods store.